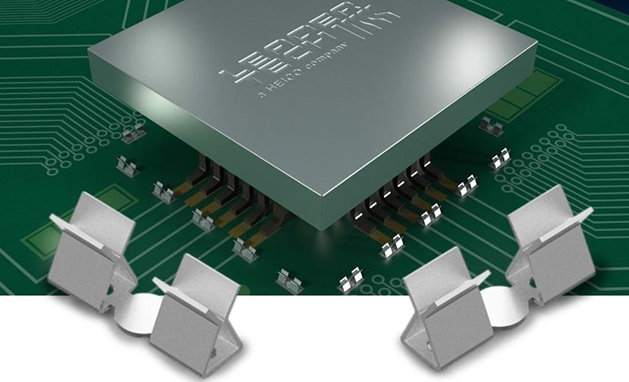 Tampa, FL—Wednesday, December 09, 2015— Leader Tech announces the launch of a new product innovation that provides one of the fastest and most cost‐effective ways to secure EMI shields to a printed circuit board. The company’s new Tech Clips can be attached to any circuit board using manual or high speed automated placement equipment. Once on the board, the clips securely hold shield covers that range in thickness from .008” to .010”. The new, lightweight surface mount Tech Clip design completely eliminates the need for manual through‐hole soldering and provides unencumbered access to board level components for easy assembly, rework or maintenance. Delivered in convenient tape & reel packaging, Tech Clips can be placed anywhere on the PCB and have virtually no limitations on shield size, shape or height. Leader Tech also offers a large selection of shield covers that are available from stock. FREE samples of the new Tech Clips are available for immediate delivery. For additional information or to request your free sample, contact Leader Tech at 813-855-6921 or sales@leadertechinc.com. Next post What is a Ferrite?